Vietnamese Musk Duck Noodle Soup - a Guide to Bun Ngan with Details! Home » Vietnam Travel » Vietnamese Food » Vietnamese Musk Duck Noodle Soup – a Guide to Bun Ngan with Details! Vietnamese Musk Duck Noodle Soup – a Guide to Bun Ngan with Details! Musk dusks are so popular in Vietnam, and diners can enjoy musk duck in several versions, ranging from noodle to soup dishes. And, “bún ngan” is a delicious noodle soup that attracts Vietnamese people and tourists with sweet musk duck flesh, tough bamboo shoots, fresh, hearty broth, soft noodles, as well as an amazing fragrance. 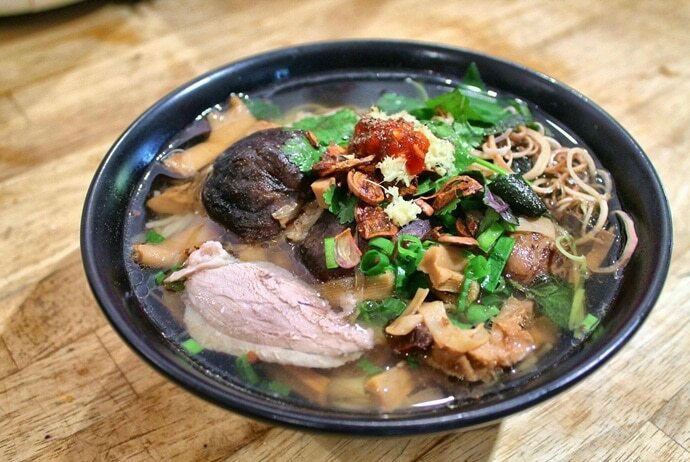 People can enjoy Vietnamese musk duck noodle soup in many restaurants and street vendors in Hanoi as it is really easy to find. The flesh of musk duck is boiled soft (yet not friable) and fragrant while the soup (broth) is naturally sweet thanks to the bone stewed within long hours. Moreover, people can enjoy bamboo shoots and vegetables together with this dish to reduce the greasy taste. And now, in this article, we will introduce to readers the Vietnamese musk duck noodle soup, well-known as “Bún ngan”. Let’s get it started right now with VinaFood! Musk duck noodle soup is a favorite dish of many people in Vietnam, especially those in the North of the country. For tourists, there are many places to enjoy Vietnamese musk duck noodle soup in Hanoi, and you can visit any of the following places if you want to enjoy this special noodle soup. All of these places are well-known and always crowded with many consumers. 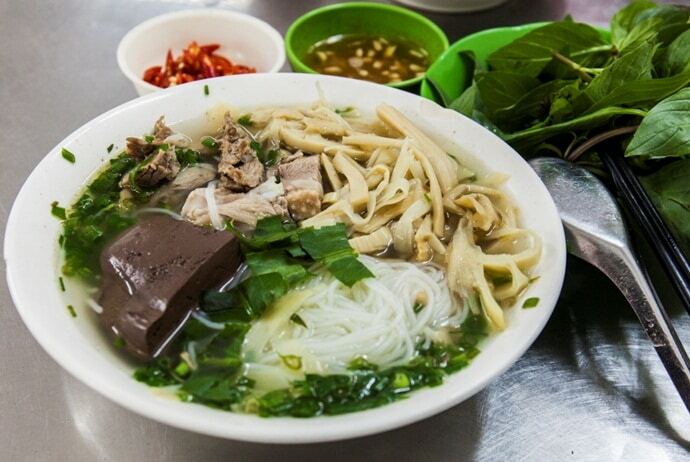 When it comes to Vietnamese musk duck noodle soup, most people in Hanoi may think of “Bún ngan Nhàn” that is known as one of the most famous noodle shops in Hanoi. The bowl of Vietnamese musk duck noodle soup here is very delicious. You do not have to worry when finding this restaurant, because it is located in the alley that is famous for many eateries. This restaurant has a few small tables placed on the sidewalk, and the consumers have to line up. The noodle soup here is full of musk duck meat, dipped in a plate of lemon, salt and chili. The soup base is flavorful, and the dusk duck meat is delicious. This dish here is made from musk duck meat, bamboo shoots, white rice vermicelli noodles and green onion, served in the broth that is made from stewed pig bones. This restaurant is always crowded and requires you to be patient to taste the dish. 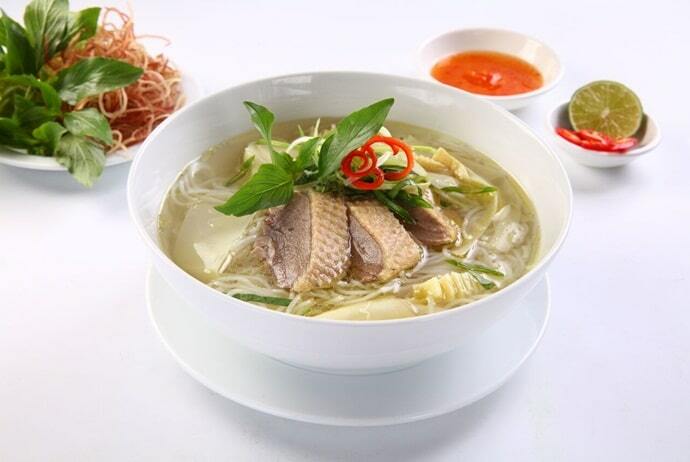 If you are a fan of Vietnamese musk duck noodle soup, then you may want to enjoy this famous noodle soup. Located on Phung Hung Street, this restaurant is famous for delicious noodle soup. The owner of the restaurant was interested in cooking, so she decided to learn how to cook this dish delicious and find her own flavor to make the brand for her restaurant. The noodle here is quite pale if compared to that of other restaurants, but the meat is quite thick and sweet and bamboo shoots are soft. Guests often call a plate of cut musk duck or a bowl of rice noodles folded with bamboo shoots. The sauce here is the combination of lemon, fish sauce, chili, and vinegar. When the sauce combines with the musk duck meat, it creates a perfect combination. The taste of water used in this noodle soup is very strong and the smell of water is clear. Apart from noodle soup, she also sells lots of musk duck dishes such as heart, legs, neck, wings, etc. The restaurant opens from 9 a.m, but consumers come to the restaurant early, so these dishes often run out very fast. The neck and middle wing is the favorite dish of many people. Besides, this restaurant has fast service, but during the peak time, it is crowded with consumers, you will have to wait a bit. However, it has been commented that the bamboo shoots are cooked too long, so they are quite soft. In addition, the restaurant also serves mixed noodles, but it is considered to be slightly pale. When it comes to finding Vietnamese musk duck noodle soup, you can consider visiting a small restaurant on Hang Voi Street. 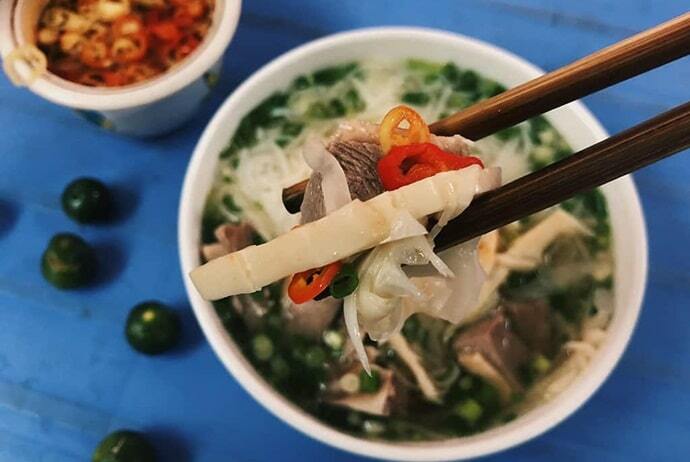 The price of musk duck rice noodles is only 25,000 – 30,000 VND / bowl, but this restaurant has entered the list of Vietnamese musk duck noodle soup shops to try in Hanoi. The bowl of musk duck noodle soup has a lot of musk duck meat and bones, so the water here is sweet. The most impressive thing of this musk duck noodle soup shop is the sauce with garlic and vinegar. Also, chili paste is available in the box, and you can self-cater as much as you like. This is the favorite dish of many eaters, especially on cold days. Actually, this is known as a great choice for those who want to enjoy musk duck noodle soup in Hanoi. Learn More: Is Vietnamese Food Healthy? 15+ Best Healthy Foods In Vietnam! This is another famous restaurant where sells Vietnamese musk duck noodle soup that you should try out if you want to enjoy this dish in Hanoi. The noodle soup shop here is small and extremely crowded with diners. The shop can accommodate up to 20 eaters both on the sidewalk. So, crowed groups of people come to eat have to go to the nearby fruit salad to eat and order drinks. Like other restaurants, this restaurant also has noodle soup, bamboo shoots, vermicelli, fried vermicelli, etc. It serves a bowl of sweet sauce, it is a perfect combination. The freshly chopped chili and garlic combined with the sauce is a plus point for this noodle shop. Whenever you eat Vietnamese musk duck noodle soup at this restaurant, you should pay attention to a point that although it sells the whole day, but in the evening, it sells at 16 Hang Can. Actually, this may be also an interesting point that eaters should not forget. This is also another place for selling musk duck noodle soup that you should try out, if you have a chance to visit Hanoi and want to enjoy this kind of noodles once in the life. This restaurant is located in the old quarter, on Bat Su Street, opposite Vietcombank. 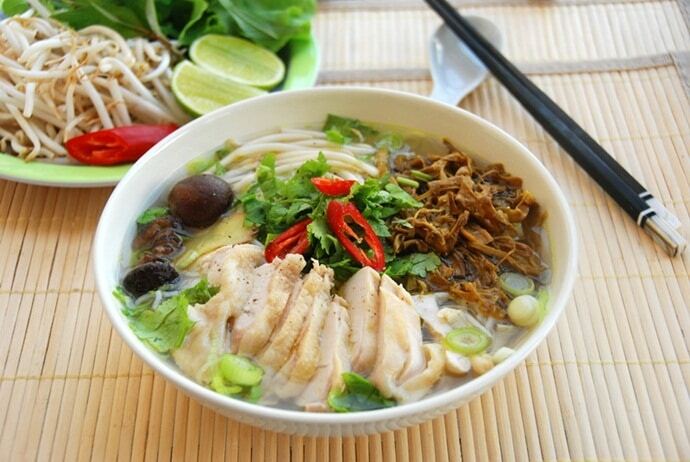 In Hanoi, there are many varieties of other noodle soup shops such as noodle soup, vermicelli noodles, etc. Delicious musk duck meat is eaten with fresh crunchy bamboo shoots and flavored sauce. The broth is not too sweet and very tasty. Just dab a soft piece of meat, crunchy skin, and greasy membranes into the bowl of sauce or soy sauce, and then feel the sweet taste of meat. 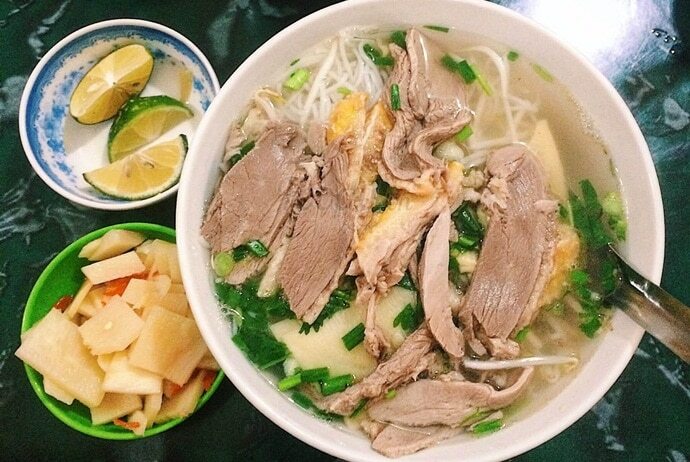 After discovering some of the most famous restaurants where sell Vietnamese musk duck noodle soup in Hanoi, we hope that you can try out this delicious noodle soup to feel the sweet taste of musk duck meat. Therefore, if you have a chance to visit Hanoi or simply, if you want to enjoy Vietnamese musk duck noodle soup, you remember to visit any of these restaurants as soon as possible.